CMS produces millions of cards at its facility each week, but it’s what we build around the cards that makes our value proposition so unique. Cards come in a variety of options. Most of the cards we produce are restaurant and retail gift and loyalty cards however we also produce hotel key cards, identification and membership cards, POS access cards and more. CMS boasts a full-service pre-press department, including three full-time designers and a web designer. Whether you choose a custom, eye-catching design or one of our numerous template design options, we will fulfill your card design needs from concept to end product. Technology and production is housed in the same facility so CMS works with our production staff to ensure our design proofs always match the output of our state-of-the-art presses. Once your cards roll off the presses, CMS can help you tailor a marketing program that leverages the full power of those cards. Today there is an ever-changing array of point-of-purchase, direct marketing, guerilla marketing and e-mail communication tactics. Which will work best for your target audience? Our customer service department will work with you to find the right product mix for your cards, including card carriers, display stands, vinyl clings and more. CMS also offers OneCard which, combined with our payment processing system, allows merchants to sell gift cards directly from their website. 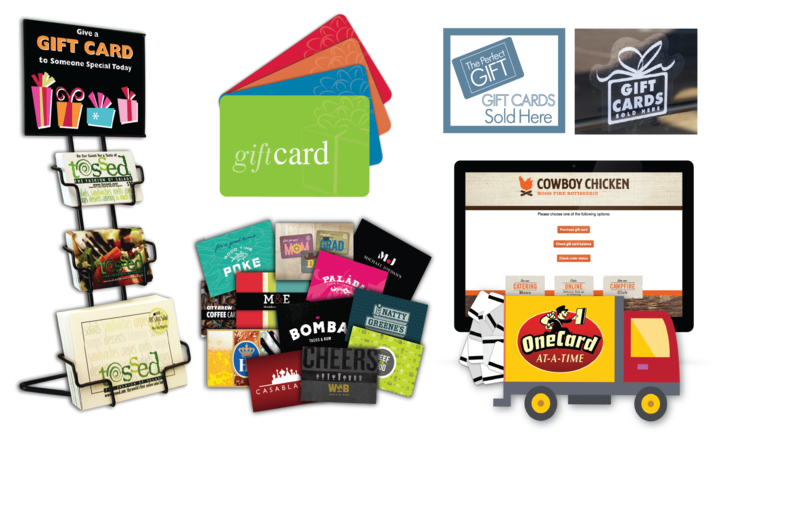 Our solution is ideal for any business wanting to sell their gift cards online without any work or hassle on your end.